The Babyliss XTP 7898BU Super Stubble and Beard Trimmer is the right choice for you if you want a trimmer for your everyday stubble/beard management. With this super-efficient trimmer in hand, you can try new styles like short stubble, long beard, clean-shaven face and with ease, comfort, and confidence. Babyliss is one of the well-known names in the men’s grooming industry, so expectations are sky-high from this product. The XTP 7898BU doesn’t disappoint BaByliss loyalists at all. Take a look through our stubble and beard trimmer review for the exciting features and attachments of this trimmer, and you will know why. Comes with a grade range of 0.4mm to 5mm, like most stubble trimmers. Generally, a beard trimmer will go up to 10mm. Comes with 24 inbuilt and lock in settings that can be easily adjusted to choose the exact trim length that you want. It goes in .2mm increments which are shown on the LED screen. Excellent battery (lithium powered) life which provides up to 70 minutes of usage when charged fully for 80 minutes. Also, a quick charge facility of 5 minutes is available. The LED screen shows how much charge is left on the stubble trimmer. Flip back the comb guide to use the edger for those lines you want to be sharp. 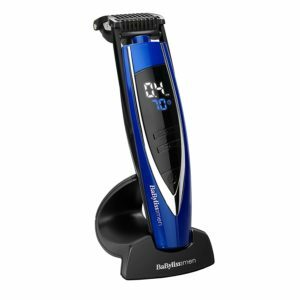 The Babyliss XTP 7898BU Super Stubble and Beard Trimmer has been designed with great detail to technology and engineering innovation. You will not find any difficulty while holding the tool and you will be thrilled to find that your skin feels fresh and smooth even after you have had a very close trim. Though it is priced moderately high, because of the features, performance, ease of use and technological sophistication of this trimmer justify its price.